God’s Gift: A Spoken Word Journey with Double G | Tony Briscoe's World! While his name is Michael, he’s known on the Chicago poetry scene as Double G (G2 for God’s Gift). He’s been blazing open mics for well over 20 years in Chicago. Southside, north side, west side, east side, it doesn’t matter. He is a legend of poetic expression and authorship. 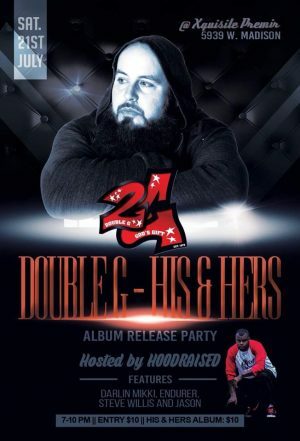 On Saturday, July 21, he will release his upcoming debut album His & Hers, a blend of Hip-Hop and poetic creativity that will bless the mic and the people who will be in the building. I sat down with one of the Kings of Poetry, Double G, as I plan to do with many Chicago artist in the next year, to talk about his journey and what it means for him. How long have you been doing poetry? I started writing when I was 12. I have been performing for going on 20 years. I don’t remember the exact date but the first venue I ever performed at was Giovanni’s on 147th. What has been your experience on the poetry scene in Chicago? I have met some phenomenal artists on my journey! In a culture that is ever evolving, Chicago poetry is the one thing that has remained consistent. Over the years I’ve seen many new faces but all have left an unforgettable impression. Chicago poetry is one big family. Sure there are distant cousins, and sibling rivalry is commonplace. But at the end of the day, our legacy and the culture we’ve established are undeniable. Who is your greatest Spoken Word influence? First and foremost I am just a vessel. This gift is exactly what God allowed it to be. As much as speaking is implied in my gift it is also the ability to absorb, digest, process, and elaborate on all that I experience. When I started performing my writing style changed drastically. The structure became so much more complex. I pulled inspiration from everywhere. I wanted the stage presence of Frank Pete, I wanted to be able to paint a picture with wordplay like Just Lillie. Soulful like M’reld, gritty like Red Storm, I wanted to have Yadhna’s courage! Like Moe Mentum wanted to teach people exactly just how valuable they really are! They all showed me what this art could be. But it was Lemon (from NYC) that showed me the importance of being true to yourself and the impact it has on your work. After that, being a lyricist, I became obsessed with being as dope of a lyricist as I could possibly become. I drew influence from hip-hop artists like Mos Def, Pharaoh Monch, Talib Kweli, but through the years it was Common and Lupe Fiasco that helped my polish the craft. They taught me how to mix the art of storytelling with the lyricism and how to make complexity and cadence coexist. So, your album is dropping in this week. What’s the title and where can people find it? The album officially drops officially on July 21st. The Title is called His & Hers. Put simply, you can find it everywhere! I initially pressed up 200 copies of a physical album. So much production and the efforts of all involved made my dream of putting a physical product in someone’s hand a reality. The wonderful folks at Team At Ease encouraged me to get digital distribution for the album. It is available on 20+ outlets, either sales or streaming sites. The most common of the two is either CD Baby, iTunes, GooglPlayay, and Amazon for purchase. Your best streaming alternative is most likely either Spotify, Tidal, iHeart Radio, and Pandora. What is your vision for this project and what’s next for Double G? I wanted His & Hers to embody what I picture the perfect relationship to be. It is a marriage in which husband and wife place God above all else, even each other, while simultaneously serving each other. (His) ~ The pieces which I glorify my Lord and Savior Jesus Christ. (Hers) ~ is the journey I have taken to meet my future wife in addition to love letters to her! Getting in the booth at Studio 11 lit a fire in me bruh! Coming very soon I have two projects slated to be released in the next year and a half Lord willing. The first album will be called Jeremiah. It is inspired by Jeremiah 1: 1-10. The second project will be called Goliath: A giants submission. I will be working on both albums simultaneously. I also have a play called “A Day In The Life” I have yet to bring out. I am also currently writing another called the “Ninety9”. I am also going to work my first book in there somewhere. Do you think there will be a true poetic collaboration CD in Chicago? I honestly believe that the era of poetic collaboration has been ushered in with the release of His & Hers. Tracks like Ambassador and #Freedom are just the beginning. Hopefully, under the umbrella of The Movement, we will begin to see that change. I think that the right causes have brought us together. It is a tragedy that loss of life due to gang violence and police brutality and corruption are the spark to our creativity but is an opportunity to take ourselves and our ego’s out of the equation. The poetic collaboration will happen in the City of Chicago. It will spark a call to arms for the rest of the nation. We are called to the Kingdom for a time such as this! It was great chopping it up with Double G. His & Hers CD release is a ticket-only event that will take place July 21, 2018, at Xquisite Premier, located 5939 W. Madison, Chicago, IL 60644.